I recently picked up D-Link DNS-320 ShareCenter Pulse 2-Bay NAS for some home storage. 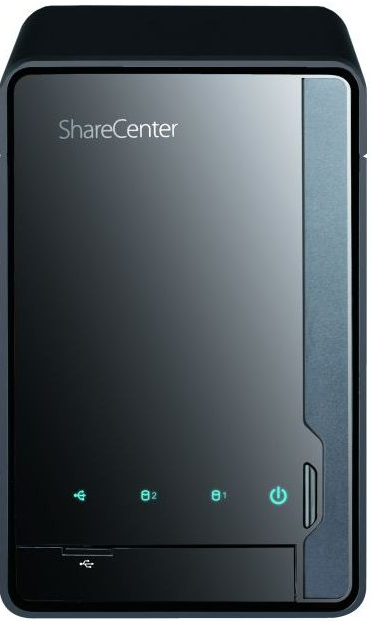 I have been quite impressed by the device, particularly due to the price, and have written a short review of the ShareCenter below. The DNS-320, which is the two hard drive bay version of the ShareCenter, cost me £63.99 from a large online retailer. Compared to other small home NAS devices on the market this is very cheap, especially when compared to rival NetGear products. The device itself is very compact and comprised of black ABS plastic with a gloss finish, adding to the light feeling of the product. It feels sturdy enough to survive a drop, but it isn’t as good a build quality as a NetGear ReadyNAS Duo, however the quality of both products are certainly reflected in their respective prices. The ShareCenter also contains a standard eluminted power light and LED indicators for both drive bays. The setup of the device was extremely easy, after unboxing the product adding the hard disks drives took seconds. The top of the ShareCenter slides off exposing the two SATA data and power connectors for the hard disk drives. To install the disks, it was a simple case of plugging them directly into the SATA connectors and sliding the lid of the ShareCenter back in place. The only remaining parts of the setup after this was to connect both power and Ethernet, and then turn the device on. Once the device was powered on, D-Link provide an easy setup wizard on an bundled CD-ROM that discovers the NAS on your network and guides you through processes such as IP addressing, RAID setup and domain membership, if required. Out of the box my ShareCenter was running the base firmware version of 1.00. The web interface for this version of firmware is admittedly very basic and not aesthetically pleasing. The first thing I did was to download the latest version of firmware (Version 2.00) from the D-Link website and apply it to the device. Firmwaring the device was very simple, just downloading the firmware file and selecting it through the web management interface was all that we needed. After applying the firmware update a major GUI change is applied, amongst many bug fixes and new features. 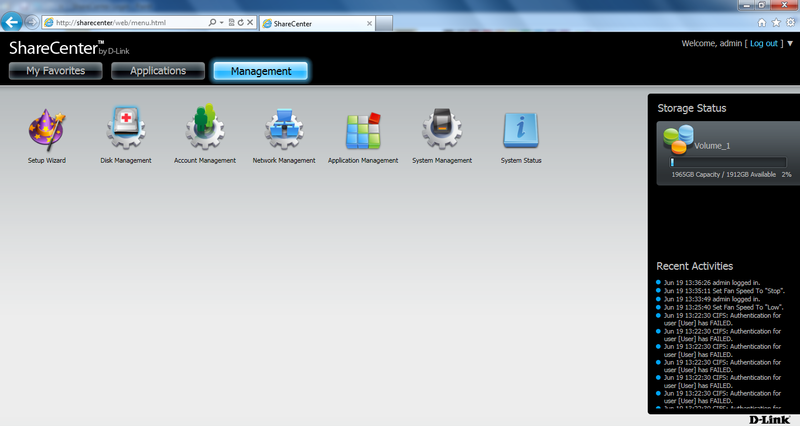 A screenshot of the new management GUI is featured below. Performance of the NAS, contrary to other reviews for the DNS-320 on the internet, was actually quite good. 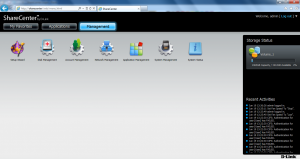 I have populated my ShareCenter with two Samsung HD204UI Spinpoint F4 2TB Hard Drives which is connected over a 100 megabit network. When transferring a single 40 gigabyte file to the NAS I was getting a solid 10.2 megabytes a second. When transferring 1.8 gigabytes of data to the NAS, which was made up of around six hundred individual files, I received 9.25 megabytes per second. Overall the D-Link ShareCenter Pulse is a great device for a small amount of money when compared to other 2 bay NAS solutions on the market. It’s high storage capacity, management, power efficiency and DNLA compliance make for a great device if your looking for some cheap networked storage. For more information on the D-Link ShareCenter, click here.